Coming from Australia I've become very accustom to long-haul flights. Y'see, to get anywhere around the world from Australia, it takes a while. Just pull up Google maps and take a look at how far we are from the rest of the world. Don't worry, I'll wait. There we go. And yet, no matter where you are in the world, you're bound to come across an Australia, a Kiwi (New Zealander for those uncommon with the term), and a Canadian. Go figure. Lately I've starting noticing the people around me at airports and on planes. I find most of which, have no clue of what they're doing, and are not prepared. Some bring the largest bags I've ever seen to the airport, struggling to lug them to the baggage check points. Others start drinking copious amounts of alcohol before they've even boarded. And others, are just plain rude. 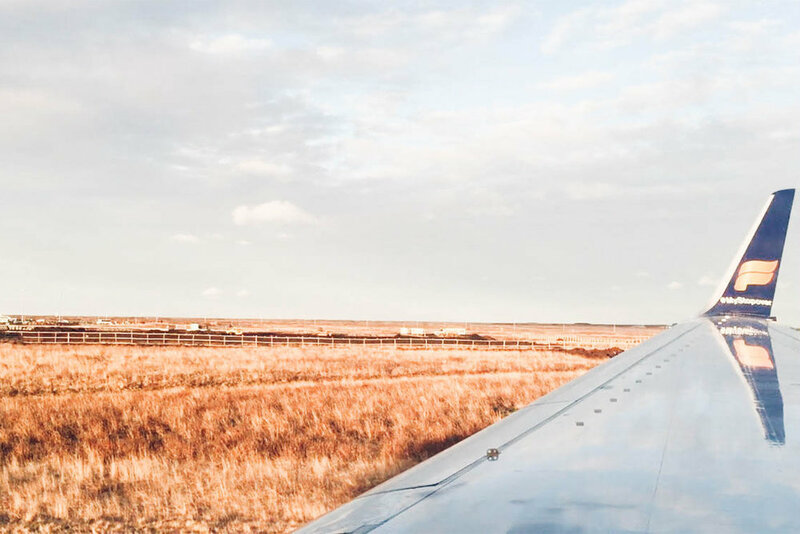 Having experience my fair-share of long-hauls, and witnessing some very clueless people, I thought it a great idea to share my top 10 tips to long-haul flight success – scoring a whole row to yourself and all! First-things-first, skip the lines and check-in yourself. I'm sure you're completely capable, and honestly, it's getting easier and easier. Some airports, particularly around Europe, even let you check your baggage in yourself too. Talk about ease! If you’re flying with a friend, pick an aisle seat and a window seat, leaving the middle seat in-between free. Most of the time, people won’t choose that seat, and you’ll have the whole row between the two of you. If someone is seated there, ask if you can swap. Chances are, they’d much prefer to sit aisle than between two friends. Your best bet is to also choose seats toward the back of the plane. I’ve found the seats at the front tend to get filled to the brim, middle seats and all. You’ll have a much better chance getting a whole row to yourself if you sit right at the back of the plane. The only difference is, you’ll feel turbulence a little more than at the front. But hey, what's a little turbulence when you have a whole row to yourself? These jacks allow you to use your own headphones with the in-flight entertainment system – and hopefully you came prepared some noise reducing headphones and not the ones that came with your iPhone. Let’s face it, no matter what airline you’re flying with, those airplane headphones are dodgy! And what's best, when you're landing, and everyone's sitting around restless twiddling their thumbs having had to return their headphones to the stewards, while you can finish the series you've been binge watching. You can find these headphone jacks at a most electronic stores, just ask a staff member. Don't be afraid to ask the stewards for water. Hell, even ask if you can just have one of those 2L bottles they've got stocked. Worst case they'll say no, but will definitely remember to frequently bring you a glass of water. Remember to bring moisturiser and lip balm, and slather it on! Don't be shy here. Every moment you have, give yourself a moisturise – your hands, feet, lips, elbows. Moisturiser will not only help you feel fresher, but also prevent your skin from completely drying out! Wipes are also handy, that way you can wipe that plane-grime mid-flight. Just remember, you're only allowed 100ml of liquid on planes. Don’t assume you’ll be offered complimentary socks. Pack some warm woollen socks to keep your feet from falling off. Even if your final destination is that tropical holiday you've been dreaming of since you started that full-time job 3 years ago. These will be handy whether you’re cold, or need an extra pillow, or something to soften leaning against the arm rests. You can never have enough layers to get you comfortable in your economy seats. Assuming you're in economy, if not, then you bloody enjoy that flight buddy! And I expect a e-post card from the airport going a little something like, 'na-na-na-na-naaaa-na'. Never, and I mean NEVER, go to the bathroom without shoes on. You never know what mess you’ll be walking into. Honestly, I think I've seen the worst, on a flight from hell – but that's a story for another time. So shoes that slip on and off easily help for wet smelly socks. Ew. That way you’ll always have something new to listen to when you’re feeling sleepy, but can’t get your body to relax in the seated position, but also too tired to concentrate on a screen. Don't worry, we've all been there. Honestly, I thought I was too cool for a neck pillow for years and years of travelling long-haul. I thought, really, how often would I reaaally need one. Then, I travelled with my mum who had one, and I used it on the plane, at the airport, in the hotel room. If you really struggle to sleep on planes, I urge you to invest in one. Particularly the ones that deflate, that way they pack down quite small in your bag, and blow-up in a few breaths, making them the perfect travel companion. Last but not least, and possibly my most important tip, be nice to the stewards. Be nice, like your practicing your manners with your mum watching you. Be kind people. Thank you’s and please’s are a must. Smiling is important too. Do you travel long-haul often? How do you manage to get through the whole experience?